Author: Dagmar Wagner-Robertz †. Series edited by: Michael Bollig, Wilhelm J.G. Möhlig. 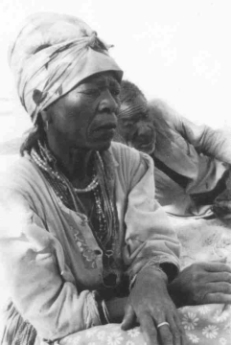 This electronic publication contains further valuable source material on the culture of the Dama of Sesfontein/Namibia. It consists of 22 selected song texts, recorded by the late author during two field research studies from 1972 to 1975 on tape and subsequently transcribed and translated with the help of a local research aide. The songs of the Dama can be broadly divided into two categories: on the one hand the group songs, presented by several people or sung by a lead singer and accompanied by the audience. These songs have a concommittant story explaining and elucidating the song text. The second category is comprised of the bow songs or individually sung songs, with the singer using the text and music to express his inner thoughts or state of mind, without any participation by the group. In this latter group the singer uses a hunting or music bow for accompaniment. After having finished the song, the musician often adds some comments or explanation to ensure that the audience has gathered his or her meaning. The 22 poetic texts are rendered both in their original Dama version and as an interlinear translation into German. Numerous annotations on the semantics of the individual verses are provided to enable the reader to measure the proposed translation of the original expressions by the author. 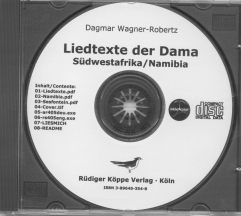 Each song is provided further with an interpretation given by the singers or the group, and by the author, attempting to ascertain the significance of the songs in the historical and socio-cultural framework of the Dama of Sesfontein. This volume follows on the documentation and interpretation of a healing ritual of the same ethnic group compiled by Dagmar Wagner-Robertz (1944–1991), published by us as vol. 12 of this book series. Using the links under “pdf documents“ you may download the full text of the study and the maps.